Please allow 10-14 business days for custom orders to ship. 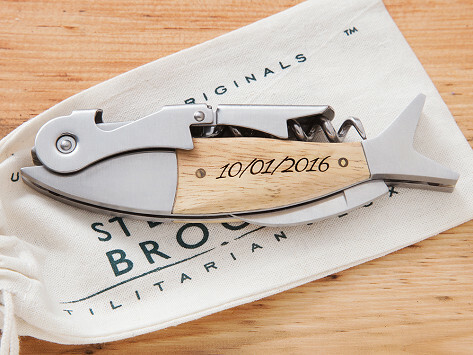 Tough stainless steel and rustic white oak make this unique wine opener equal parts durable, useful, and beautiful—and it’s guaranteed to last a lifetime, too. 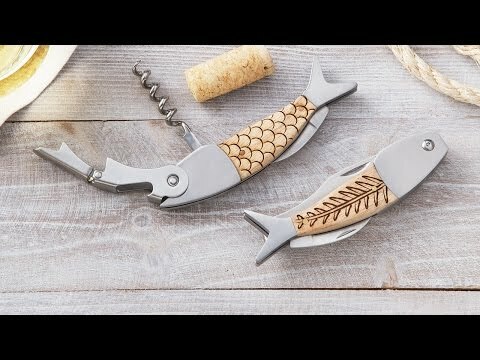 A fish-inspired design is etched by hand on the Florida coast, and the finished result is a distinctive corkscrew that feels at home on the boat or at a dinner party. Add a custom engraving to make one feel even more special. Dimensions: 4.75" x 1.25" x 0.38"
Whether you’re popping a bottle or slicing and cutting, the result is a tool that balances elegance and utility, and that feels at home both on the water and over dinner. Their goods can be personalized, too, for a custom gift that will function beautifully and look great for years to come.